Covenant Groups - We believe that this is the avenue through which God is calling us to deepen our communal roots. in these small groups, clusters of people gather to study the Bible, share testimonies, do some reading together and also to serve together. If you'd like to know more about Covenant Groups and how to get involved, you can either email Pastor Criss or you can enter your information here. Women's and Men's Bible Studies - Certainly the longest standing Bible study group our church has known, this is a Bible study for women that meets Wednesday mornings at the church from 9:30-11:30am. For more information regarding these Bible Studies, contact the office. Sunday School - From Fall to Spring, we have Sunday school for all ages and nursery care is provided during Sunday school as well so parents of young children can get plugged in and meet the people of this church during that time as well. We always offer classes for children and youth beginning at 3 years old and going through high school. We also offer at least two adult Sunday school classes at a time. Every week, we have what we call "Second Look" - this class meets in the front of the sanctuary to discuss the morning's sermon and the text that was shared, hoping to go a little deeper in exploring the applications of that scripture's meaning for our lives as individuals but also together. We always try to have at least one more class going as well; this is often more like a traditional Bible Study or else a class on a certain topic. These classes change from time to time and are announced on Sunday mornings and are also listed in the bulletin as well. 9th-12th Grades - We meet on Sunday night from 6- 8 pm for dinner and Bible Study. See the church bulletin for location. 18-25ish (Arigaa!) - Arigaa is Inupiaq for "sweet" or "beautiful", which is an excellent description of what this group really is. To learn more about Arigaa, click here. 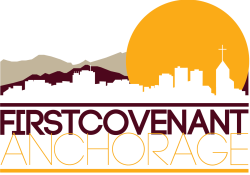 First Covenant 101 - This is an occasional, half-day seminar that introduces you to the Covenant Church, the history of the Covenant in Alaska and specifically to First Covenant Church - what we believe and how we've come to be the place we are. The 101 class is the first step toward becoming a member at First Covenant as well. If you'd like to know more about membership, or the 101 class, contact pastor Criss for more information. One of the joys of the Christian life is to serve alongside one another for the sake of loving God and loving others. Here are a few meaningful ways you can partner with us at First Covenant in Christian service. Ultimately, there are many, many more opportunities in which people can serve at First Covenant and perhaps God has placed a specific passion in your heart for something different. If that is the case, please contact pastor Criss to discuss how we might discern together new ways to love God and love others. But here are some of the meaningful ways that you can serve at First Covenant and have a real impact on our church and in our world. Can you give a ride? Driving people to church is such a simple task, but we have such a difficult time finding people willing to pick up folks who need a ride to church. It is often that people in our community need a ride to church and we are unable to find a ride for them. Please consider this incredibly important (and easy) task as a real opportunity to serve those in our church. Contact the church office to let us know of your availability. Can you cook? Every first Sunday of the month, we have a potluck meal after Sunday school and we invite everyone to bring a dish to share, but we also encourage those who are visiting and who didn't prepare a dish to stay as well so it is a very significant ministry of hospitality for those who cook a little extra and "supplement" our potlucks with enough to feed out visitors as well. Also, during the school year, Aarigaa (our college and young adult ministry) meets every week and share a home-cooked meal together. Those meals are provided by families in our church who consistently show the love and welcome of Christ to our young adults. Please consider signing up to cook a meal. To contact Aarigaa click here. Are you skilled with your hands? Our facilities ministry team take primary care for our property and building, but we are often in need of more help on specific projects from plumbing to construction to landscaping to decorating and more. If you love to serve with your hands or behind the scenes, this might be a very real way for you to get involved and make some really nice contributions! Worship Technology: For some reason, this language of "technology" can seem scary to folks who wonder if they know enough to contribute in this area. It is actually incredibly easy to run the video camera and the computer used for projection during worship services. You could be trained to run the computer in 15 minutes! If you'd like to serve by running the sound board, more training is required, but the basics could be learned in an afternoon class. Once we have some interest in these areas, Criss will coordinate some training times - or you can simply email him to arrange an individual training. We are always in need of help in these areas, so we will work with you to get trained as soon as you are able! Are you musically gifted? If you have musical talents and would like to express interest in doing special music sometime or would like to explore joining a worship team, contact pastor Criss for more information. Are you a people person? We at First Covenant need people like you! One of our real goals in this place is be a place where the newcomer and outsider feels welcome. We believe that we need to improve in the area of hospitality if we are going to welcome people better. We are looking for people who are just willing to share a smile, shake a hand, open a door, or just show a genuine interest in the people who enter our doors. Contact Pastor Criss if you are interested in this crucial ministry. Better one on one? Research today says that in order to keep most young people connected with the church through their high school, college and young adult years, they need at least 5 mature Christian adults in their individual life supporting and encouraging them through those identity forming years. We are always looking for adults whose walk with Christ is evident to spend some intentional time with our young people occasionally. There's not a trick to it either. One of the best ways to mentor a young person is to bring them along with you as you do some of the things that you would normally do anyhow. In that process, they can possibly learn some practical life skills from you, but more importantly, you become a model to them as you spend time together of what a mature believer looks like. To learn more about mentoring, contact Pastor Criss. Gospel Rescue Mission - Once a month, our church is responsible for a worship service at the Gospel Rescue Mission, a local homeless shelter with a recovery program. If you'd like to learn about that ministry or how to get involved, contact the office. Certainly, there are always more ways to serve God and use the gifts that he has given us, but we hope that these have helped you consider how you might get involved. If there is something different that weighs on your heart, please contact one of our pastors and we can work together to discern how God might open new doors together.